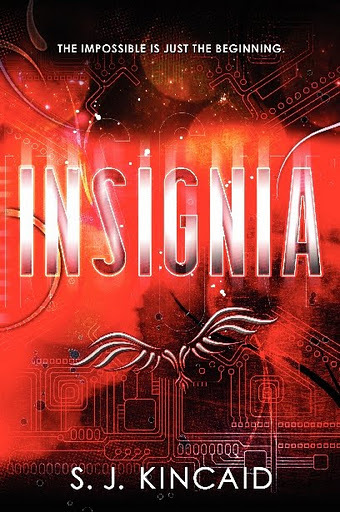 Insignia is completely different to anything I would usually read. When I first read the description I was intrigued, I never expected to be compelled by this book. If I'm honest I thought it was more for boys but now I can safely say I was mistaken. Tom the main character is likeable and he's a character that you just can't help liking and feeling for. Tom Raines is an average spotty teen who just wants a normal life. Because of his Dads gambling he has no real structure or routine in his life,that is what he longs for. Tom never realised his love for VR games would change his life forever. This story is so compelling- the aspects of propaganda and military life is intriguing and it feels naughty. It's like you're reading something that you shouldn't. It's as if it should come with a message- this book will self-destruct after the very last sentence. Insignia really made me think about what's happening around us. I've always been sceptical of the army, as these days the young boys and girls aren't fighting for us. What was really interesting is how much a person can be brainwashed- even the strongest of people have a weakness. It's sad how the public don't ever question what they're told via the media. Tom hadn't realised how much he'd been missing out on in life until he met Vik, Yuri, Beamer, Wyatt and Heather. He had friends who liked him for him- warts and all. Tom Raines is a feisty character, who knows how to stand up for himself and he's new found friends liked him for that. I don't want to ruin the story but there is a few times Tom's friendships are compromised for no thought of his own. As a reader you're willing the real Tom to suffice as are his friends. I love the fact that tutors and other pupils changed their thoughts and feelings towards Tom as the novel progressed. If you've ever played sim's you'll fall in love with this novel- the fantasy and reality of the sims was amazing. Tom became obsessed by the warrior Medusa- he would regularly watch videos of her fights before he got to know her. Was his fantasy what he'd hoped for in reality? You'll have to read for yourself to find out. Can you really fall in love with someone you don't know? Or will plain right cruelty change that first thought altogether? I honestly didn't realise this was a series until after I'd finished the book. I cannot wait to see what Tom gets up to next and whether he can mend the relationship between him and his ongoing obsession with Medusa. 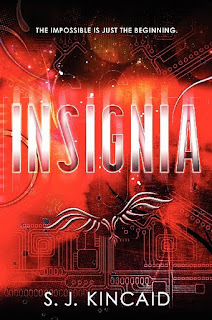 When you encounter Insignia you'll never play a game in the same way again. Oooh! This sounds really interesting! Thanks for the review!